I’m not going to lie. Code of Justice has received some very nice reviews. And they’ve made me smile. Some of them have included constructive criticism … and I appreciate that. I’m under no delusion that my books are perfect or that I can’t grow as a writer. I want to grow as an author. My goal is to get better, improving with each book. I say all that to explain about my evening. I’d had a wonderful day with a friend watching movies. Then a lovely drive through rural Tennessee and off to Saturday evening church service. 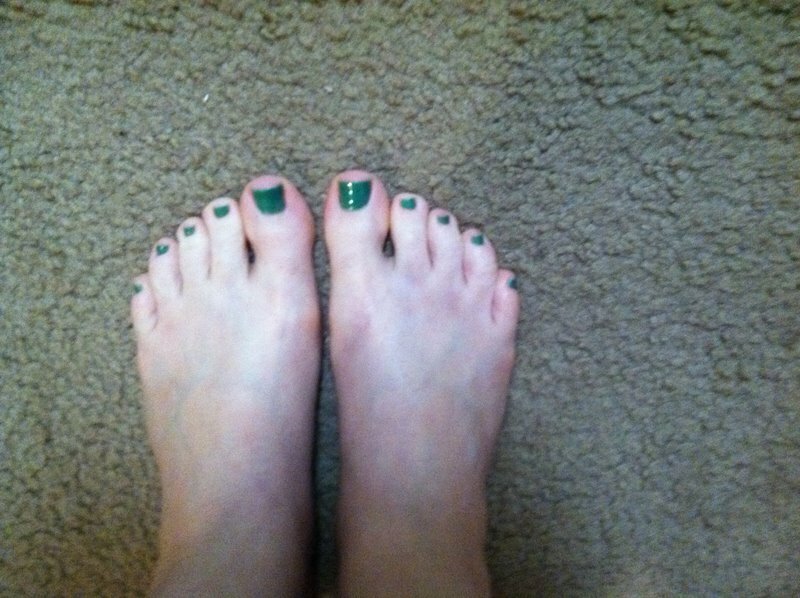 After the service, I decided it was high time for a pedicure. The weather is far too lovely not to be showing off my toes. So I sat down with this guy–whose name I can’t pronounce, let alone spell. 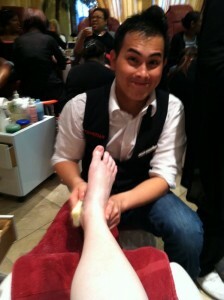 We’ll just call him PM–Pedicure Man. PM quickly had me giggling over my ticklish feet and looking for something to distract myself. Soon I was zipping through my e-mails and happened to receive a google alert e-mail with a notice that there was new review of Code of Justice up at ChristianManifesto.com. I’m still not going to lie. That doesn’t feel good. And it might have reduced me to tears if PM hadn’t been performing magic on my feet. 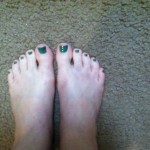 As PM painted my toenails green (yes, I was in the mood for something fun! ), I began to ponder Mary’s review. It all boils down to one question, is what she wrote true? That’s a hard question for me to contemplate. Even harder to answer. Here’s the realization I’ve come to: Despite my book’s faults, despite my imperfect writing, despite what some call unrealistic characters and poorly written plot, I trust that God has a purpose for my book and that He’ll use it, imperfections and all. And I’ve decided that’s more than enough for me. Oh, and there is at least one thing in that review that is factually incorrect. Steeple Hill didn’t send Mary the book for review. Well, folks, the reviews for Vanishing Act are starting to roll in … very slowly. But still. The first official review (ie, posted on the interwebs) is up at Tammy’s Book Parlor. And according to Tammy’s blog, it’s also going up on ReadersFavorites.com. It’s just not there yet. A fast, sweet, intrigue with romance and great suspense. I enjoyed reading this book because of the suspense but I also liked the way the author put God as the main source of life and joy. Yes, I believe, a good suspense story can include a God who loves us and takes care of us. If you’re looking for a great read that doesn’t have cuss words or inappropriate bedroom scenes but instead is a story of people somewhat like you and me who trust the Lord during difficult times then this is a book for you. Thanks for the review, Tammy!